Video Game Grooves is proud to present our first B-side production: an audio interview between friend-of-the-show Thomas Quillfeldt and artist/musician Niklas “El Huervo” Åkerblad. 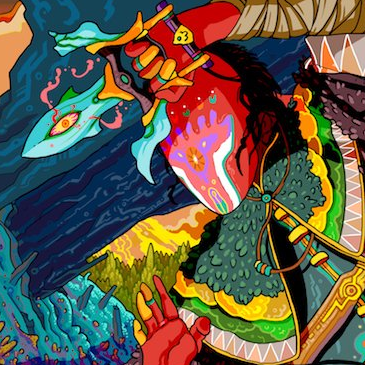 El Huervo is known for his musical compositions in Hotline Miami as well as his prolific work on his own music, but most recently the vinyl-collecting community will know him for the artwork he’s done for the Laced Records release of Absolver. In the interview, Tom and Niklas discuss his colorful artistic stylings, how he came to work on the project, and what it’s like to be a collaborator on the Austin Wintory soundtrack with RZA from The Wu-Tang Clan. We heartily invite you to dive into the Laced Records deep dive into the art and production of the Absolver vinyl at the Laced Records blog. (That’s one amazing gif! -J) In the meantime, watch this space for your regularly-scheduled podcast! Thanks for listening!